Call Family Distillers have been expertly distilling and illicitly distributing moonshine for 7 generations: since the 1860s. Their history begins with Reverend Daniel Call, who developed his own brand of whiskey behind the counter of his store and famously taught Jack Daniels the art of distillation. By the 1940s and 50s, the notorious Willie Clay Call was running hundreds of gallons a night in his legendary car without being caught. The Call Family name is well-known in the region and tales of their exploits abound — their domain of Wilkes County, North Carolina is rightly known as the Moonshine Capital of the World. 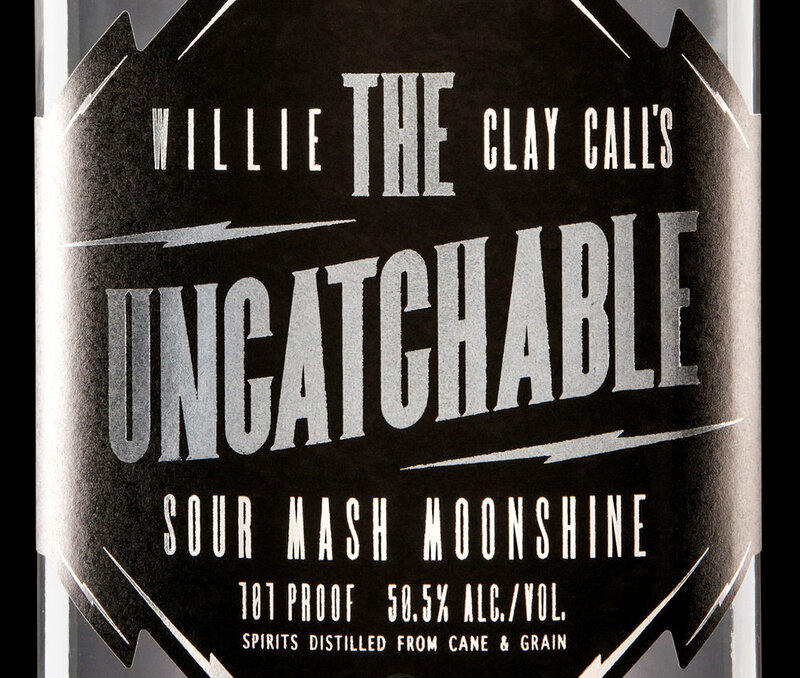 Willie’s grandson, Brian Call, has most recently taken the wheel as the head distiller of Call Family Distilling. He decided to bring his family business into the modern era, finally making their sour mash moonshine available legally. When Brian and his nephew Brad came to us for branding and packaging, we were tasked with paying tribute to 150 years of family moonshining history. The Call Family brand is headed by a crescent moon, which serves both as a monogram for the Call name, and as a symbol of the family’s long years of running whiskey by moonlight. White bolts cross beneath the moon, an echo of Willie Clay Call’s thunderously loud car, whose vanity plate boasts “White Lightnin’.” The combined shapes of the lightning bolts under the crescent moon recall a skull and crossbones, evoking the illicit and dangerous nature of moonshining, as well as moonshine’s notoriety as a potential poison when not distilled by expert moonshiners. For the brand personality, we decided to focus on the character of Willie Clay himself, starting with the lineup name: Federal ATF Agents, after countless high-speed chases, gave him the nickname, “Uncatchable.” It seemed fitting to pay tribute to Willie Clay’s trademark speed and stealth, with a nod to the racecar culture he and other moonshiners inspired — NASCAR itself was born from these moonshiner chases in the aftermath of Prohibition. For the packaging, we set our type front-and-center in bright silver foil and pearl white, popping it off the matte black labels. Lightning bolts form the frame and lend their shape to the dieline. An illustrated portrait of Willie Clay Call crests the cap strap, putting the final seal on the mason jar — the same jar of moonshine handed down for 7 generations, now available during daylight hours. With typography playing a central role in the Call Family brand world, we decided to create two custom fonts: a serif typeface with strong personality for display text, and a sans-serif type suitable for smaller copy. Both are narrow and upright, with strong verticals and tight curves– subtly reminiscent of an oval motor speedway. For “The Uncatchable Regular,” we designed serifs with sharp diagonals to match the feel of the lightning bolts. The Reverend Daniel Call, seen here with a wild cat, late 1800’s. Large underground moonshine still operation. Located in Call section Wilkes County, circa 1950. Large steam still operation located in Call’s Section, Wilkes County. Note the 4×4 open wood fermentation boxes on left and the still, burners, thumper, and condenser on right. The Revenuer in the background looking on to his find. The Call Boys. Brian Call (current Head Distiller) pictured here holding a case of shine. Willie Clay Call, with one of his “White Lightnin” 1940 Fords. Willie Clay Call, “The Uncatchable,” with an authentic Wilkes County steamer still among his fleet of 1940 Fords in his garage down in Hell’s Half Acres. Aaron Brown, owner of The Garage Shop in Catawba, NC, built this badass ratrod in the style of the original land-speed racers from the middle of the 20th century. It currently holds the world record for land-speed rat rod: 197mph… a truly “Uncatchable” ride!